Beautiful certificate from the Noodle Kidoodle, Inc issued in 1996. This historic document was printed by United States Banknote Company and has an ornate border around it with a vignette of the company logo. This item has the signatures of the Company's Chairman and Secretary and is over 11 years old. In the world of toy stores, book stores, record stores and computer stores, we sensed that something was missing. At best, the choices for creative playthings, enriching books, better music and imaginative software were limited. At worst, the few quality items available were hard to find. What was needed was a large selection of well priced, quality products for children, all under one roof. So ... we created Noodle Kidoodle to fill that gap. Company History: Noodle Kidoodle operates a chain of education-oriented toy stores with outlets in New York, New Jersey, and Illinois. Formerly known as Greenman Brothers Inc., this New York-based company has a long history in the toy wholesale and retail business. Greenman Brothers was founded as the Star Trading Company in 1931 by the Greenman family. Star Trading was a modest wholesaling concern that distributed a variety of goods, including toys and housewares, from a small warehouse in Manhattan's Lower East Side. In 1946, management of the firm was handed over to the second generation, Bernard, Nathan and Sidney, and the company was renamed Greenman Brothers Inc. Greenman Brothers continued to operate on a modest scale through the 1950s, during which time the company headquarters and warehouse were moved from Manhattan to Hicksville, New York. The previously mixed inventory became centered on toys and related goods including sporting equipment and juvenile furniture. By the early 1960s analysts were predicting that toy wholesalers would become obsolete. The growth of larger retail outlets as well as the consolidation of the toy manufacturing industry meant that retailers were increasingly dealing directly with manufacturers and bypassing brokers like Greenman Brothers. It became clear to the small New York wholesaler that it must diversify and provide a new type of service if it were to continue in business. Greenman undertook two major initiatives in the 1960s to help achieve these goals. The first was the opening of a number of leased retail outlets in discount stores. Bernard Greenman, who had assumed the presidency of the company on the retirement of brother Sidney in 1964, commented on this development in a 1969 article in Investor's Reader: "With our knowledge of the toy business, we can operate these departments better than the stores themselves. They afford us another outlet for our wholesale toy inventories, enable us to experiment with hobby and sporting goods lines and help us to spot the fashion changes in toys at the retail level quickly." The second crucial move for Greenman was to take the company public in 1967. The injection of cash made available by this step allowed the company to expand and upgrade its warehouse facilities as well as to purchase expensive computer equipment. The new computerized inventory system played a significant role in the preservation and growth of their customer base by allowing the company to offer such services as price ticketing, inventory control and automatic reorder services. By 1969, these innovations had increased the number of the company's retail customers to 450 ranging from such large Manhattan department stores as Macy's to small local toy stores. Greenman's own retail operations had grown to 24 leased toy departments in a variety of discount stores in New York and New Jersey. Total sales had reached $21 million. In spite of the growth of the 1960s, Greenman Brothers operations had remained essentially a local concern with distribution confined to a 300-mile radius of the Hicksville, New York, warehouse. The first step in transforming Greenman into a national company was taken in 1969 with the purchase of Watson-Triangle, a Florida-based toy wholesaler. This was quickly followed by the acquisition of a number of wholesale toy and housewares companies, including H. Berlind Inc., Hudson Housewares Corp., Associated Sales Agency and L. & H. Sales Co. With these acquisitions the wholesale network of Greenman Brothers included warehouses in New York, Florida, Alabama, and Washington, D.C., and distribution extended over almost the entire Eastern seaboard. In addition, the company opened 24 additional retail outlets as leased toy departments in discount stores in Georgia, Maryland, Florida and Virginia. Within four years of the company's first out of state expansion, sales had almost tripled to $60 million with a net income of $1.7 million. An important part of this expansion was the diversification of Greenman's wholesale product line to include housewares and stationery. It was hoped that this diversification would provide increased stability to the company's wholesale business and provide a balance to the extremely seasonal and volatile toy market. By 1976 housewares accounted for 29 percent of total sales. Greenman also looked to a new direction in its retail market during the 1970s. In 1972 the company acquired seven free-standing stores in New York which would become the Playworld chain of toy stores. Playworld stores pioneered the supermarket format similar to the one Toys 'R' Us would later use to build the world's largest toy store chain. Although Greenman Brothers originally intended to expand the initially successful Playworld chain at a fairly rapid pace, sales bogged down in the mid-1970s, and the total number of Playworld outlets peaked in 1977 at 15 stores. With increased competition from the seemingly unstoppable Toys 'R' Us, Greenman was faced with either diverting considerable capital into its Playworld concept, or ceding the field to the larger competitor and falling back on the company's core wholesale business. In the late 1970s Greenman began to close Playworld outlets, and by 1984 only six Playworld stores remained in operation. The leased departments in discount stores that had served as Greenman's main retail presence throughout the 1960s and 1970s were also under duress during the late 1970s. A realignment of the oversaturated discount department store segment saw the closing of many of the small chains that had leased to Greenman, and the larger chains that emerged from the shake-out preferred to operate their own toy departments. Only six of Greenman's 45 leased departments that had operated during the 1970s remained in business by the end of the decade. In spite of troubles in the retail market, the early 1980s was a period of consolidation and growth of Greenman Brothers' wholesale business. In 1981 the company purchased Martin Zippel Co., a Phillipsburg, New Jersey, toy wholesaler that contributed $13 million to overall sales in the first year of its acquisition. With the addition of Martin Zippel, and the consolidation of its other distribution facilities, Greenman's wholesale operations were run out of three warehouses in Farmingdale, New York, Phillipsburg, New Jersey, and Miami, Florida. By 1982, Greenman's wholesale business was contributing 75 percent of the company's $96 million in sales and 94 percent of its $2 million in profits. Housewares contributed a substantial 29 percent of sales, but toys still made up the bulk of the company's wholesale product selection. During this period Greenman Brothers was the leading toy distributor in the eastern United States and the only toy wholesaler with a presence in more than one metropolitan area. New in the 1980s was the addition of electronic products to the toy category, with personal computers and video games appearing to be the hot growth prospect of the decade. In spite of a steady performance in Greenman's wholesale business, profit margins of only about 3.5 percent were not likely to impress investors. In addition, growth opportunities were limited because increasingly large retailers like Toys 'R' Us tended to bypass brokers and buy directly from toy producers. Greenman Brothers began to look once again toward the retail market to provide a better return on investment and more growth potential. In late 1982 Greenman acquired the Playland chain of toy stores. Playland, a customer of Greenman's wholesale business, was a Georgia-based chain with 31 units in the southeastern United States. Playland stores were located in malls and, at 4,000 square feet, were much smaller than the supermarket format Playworld or Toys 'R' Us stores. Mall-based stores were attractive to Greenman because they offered a niche that was not in direct competition with the giant Toys 'R' Us. Playland was also distinguished from its main mall competitor, Kay-Bee Toys, because of an emphasis on upscale rather than discount merchandise. President Bernard Greenman felt that the company's experience in the toy industry would enable them to offer product selection that would be attractive to the casual shopper offered by mall traffic. In addition, start-up costs for mall-based stores were much lower than for the toy supermarkets that the company had been forced to close in the 1970s. Greenman Brothers originally intended to slowly expand the number of Playland units, but in 1985 when Rite-Aid's Circus World came on the market, Greenman jumped at the chance to acquire the 189-store chain. Although Circus World had been only marginally profitable under Rite-Aid's management, Bernard Greenman was convinced that his company's buying expertise could convert the national chain into a toy powerhouse. Greenman Brothers merged the Playland and Circus World chains and began a process of renovation and upgrading of existing stores as well as opening new units. By the close of 1985, Greenman was operating 310 toy stores in 26 states, with annual retail sales of over $49 million for the retail chain alone. From the perspective of the mid-1980s prospects looked good for Greenman Brothers. Sales for Circus World stores were up 26 percent, and wholesale sales jumped an impressive 49 percent in a single year to $125 million. By 1986 total sales had reached $218 million with net income over $7 million. Analysts were predicting continued sales and earnings growth into the 1990s. However, cracks began to appear in the Greenman plan in 1987 when record sales of $244 million failed to produce a profit, and the company recorded a net loss of $3 million. Improvements in Circus World merchandising and distribution had taken longer and had required more capital than was predicted. In addition, the toy industry, which had been prospering for a number of years, entered a slump, affecting both Greenman's wholesale and retail divisions. To make matters worse, Watson-Triangle, the company's wholesale housewares division in Miami, also saw an 11 percent sales drop, and the decision was made to close the facility. While overall sales continued to grow, thanks mainly to new store openings, same store sales were flat and in 1988 Greenman Brothers, now under the management of Bernard Greenman's son Stanley, recorded another net loss of almost $3 million. Circus World had failed to distinguish itself from competitor Kay-Bee Toys, and the larger and older Kay-Bee chain had already seized many of the best mall locations. Greenman Brothers had a difficult time convincing mall owners that their malls could support two very similar toy stores, thereby limiting the number of new units that could be opened. While Kay-Bee also underwent some lean years in the late 1980s, its parent, the retail giant Melville Corp., could afford to carry the chain and had capital to invest in store restructuring. By 1990, Greenman Brothers found itself with growing debt, flat sales and tough competition in a recessionary economy. Circus World stores were back in the black, but with net profits of only $2 million and no improvement in sight, Greenman management decided to cut their losses and in August of 1990 agreed to sell its 330 Circus World stores to competitor Kay-Bee. With the sale of Circus World, Greenman was left with a profitable but stagnant wholesale business and a handful of Playworld toy stores in the New York area. After the discontinued Circus World operations left the company with a net loss of over $14 million in 1991, even the modest net income of $3.5 million in 1992 could not instill much confidence in investors. It was clear that the company had to take a new direction to regain the sales and profits of the mid-1980s. The toy retail industry had been totally transformed since the early days of Greenman's leased departments. Toys 'R' Us now controlled more than 20 percent of the retail market in the United States with no serious competitor in sight. Huge discount chains like Wal-Mart and Target also had a significant presence mostly because they could afford to take very low mark-ups and offer prices on standard, mass market merchandise that no small competitor could match. With almost 1000 units in malls across the country Kay-Bee was in firm control of that segment of the toy market. Greenman Brothers CEO, Stanley Greenman, began to search for an opening in this tightly controlled industry. Greenman Brothers looked first at the upscale, specialty toy market which was not being fully served by mass-market outlets. The company opened two higher end toy stores in New York under the name Toy Park, but the merchandise mix offered in these stores did not present sufficient differentiation from the large chains to permit substantial growth. Market research revealed that one under-represented segment in the toy industry lay in educational and creative toys, which tended to be sold in specialty stores like Toy Park but which did not have a broad distribution channel. Greenman Brothers decided that these toys represented a potential niche with room for significant growth, and in 1993 the company opened its first Noodle Kidoodle store in Greenvale, New York. The Noodle Kidoodle concept was to take the supermarket approach of a Toys 'R' Us and marry it with the specialty boutique quality of the Toy Park stores. Noodle Kidoodle would steer clear of the mass-marketed, television-inspired toys and offer instead a mix of creative and education-oriented toys, books and computer software. Noodle Kidoodle stores would be large at 10,000 square feet, but aisles would be spacious, thematic areas well marked with colorful, child friendly signs, and areas would be available for kids and parents to try out merchandise. The layout of these stores would be designed to circumvent the warehouse atmosphere that tended to frustrate parents and exhaust children in most toy superstores. Merchandise categories included science and nature, arts and crafts, games and puzzles, infants and pre-school, electronic learning and computer software. Each store would also include a small theater area with a stage and large screen television for video and live performances. Noodle Kidoodle promotion and advertising, directed almost exclusively toward parents, would stress the educational yet fun nature of the merchandise. From the start, Noodle Kidoodle was conceived of as a retail chain with units across the country. After the first store in Greenvale showed decent sales in its first year of operation and customer reviews were favorable, the decision was made to go ahead with new store openings. Over the course of the next two years 20 Noodle Kidoodle units were added to the Greenman Brothers roster, and by 1995 it became clear that Noodle Kidoodle had become the driving force of the company. Wholesale sales continued to contribute the bulk of Greenman Brothers sales, but with profit margins diminishing and no prospect for growth in sight, the decision was made to sell the wholesale business and to expend all resources in furthering the Noodle Kidoodle concept. In December 1985, Greenman Brothers officially changed its name to Noodle Kidoodle, bringing a close to its 60-year-old family wholesale business. 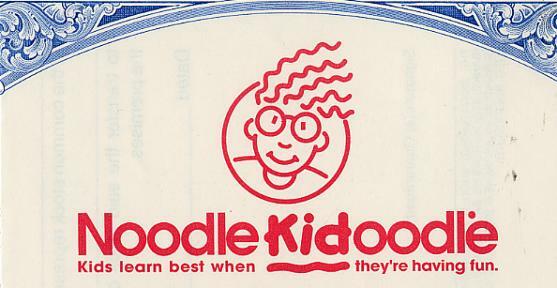 By 1996, Noodle Kidoodle was operating 21 stores in New York, New Jersey, Connecticut and Illinois with plans to open at least 15 more stores in the following year and "several hundred" by the end of the decade. Sales had reached $32 million, but the large costs associated with new store openings resulted in a net loss of $14 million for fiscal 1996. In February 1996 the company completed a common stock offering of two million shares in order to finance the rapid expansion. In an industry with tough competition and a fashion-driven customer base, it remained to be seen whether Noodle Kidoodle would be able to bring the Greenman family business into the 21st century. 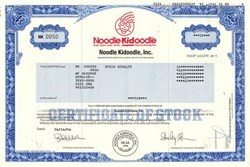 Zany Brainy acquired Noodle Kidoodle in 2000 for 1.233 shares of Zany Brainy common stock for each share of Noodle Kidoodle common stock.